Please refer to our stock # 3139 when inquiring. 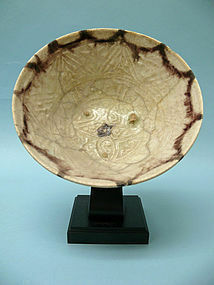 Persian Glazed Ceramic Bowl on Custom Stand. Nishapur, 10th Century CE. Repaired from original pieces with some overpaint. Bowl is 3 ¾” high x 6 3/8” diameter. Displayed on custom stand height is 8”. The era of Islamic pottery started around 622. From 633, Muslim armies moved rapidly towards Persia, Byzantium, Mesopotamia, Anatolia, Egypt and later Andalusia. A distinct Muslim style in pottery was not firmly established until the 9th century in Iraq (formerly Mesopotamia), Syria and Persia. During this period pieces mainly used white tin-glaze. Information on earlier periods is very limited. This is largely due to the lack of surviving specimens in good condition which also limits the interest in the study of ceramics of these periods. Archaeological excavations carried out in Jordan uncovered only a few examples from the Umayyad period, mostly unglazed vessels from Khirbat Al-Mafjar. In the East, evidence shows that a production center was set up in Samarkand under the Samanid dynasty who ruled this region and parts of Persia between 874 and 999 CE. The most highly regarded technique of this centre is the use of calligraphy in the decoration of vessels. East Persian pottery from the 9th to 11th centuries decorated only with highly stylized inscriptions, called "epigraphic ware", has been described as "probably the most refined and sensitive of all Persian pottery".